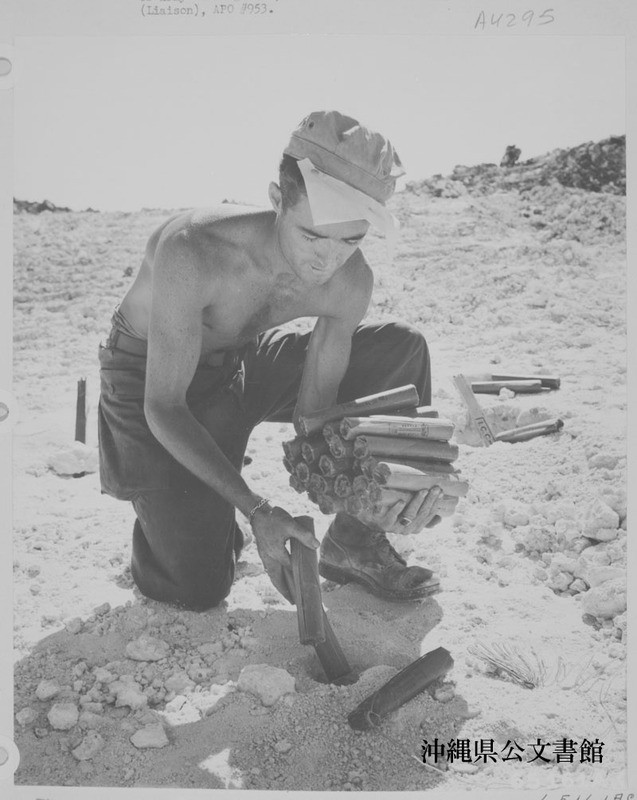 A member of the 1902nd Engineer Aviation Battalion plants charges of dynamite in coral preparatory to blasting. Ie Shima, Ryukyu Retto. 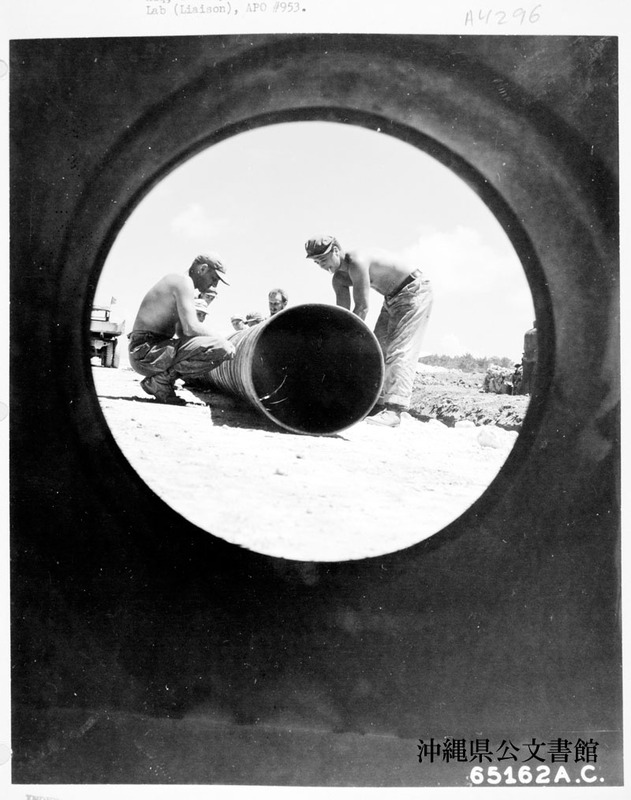 In order to facilitate drainage, men of the 1902nd Engineer Aviation Battalion lay culverts of oil drums along side the runway on Ie Shima， Ryukyu Retto. The photograph was taken from inside one of the drums. 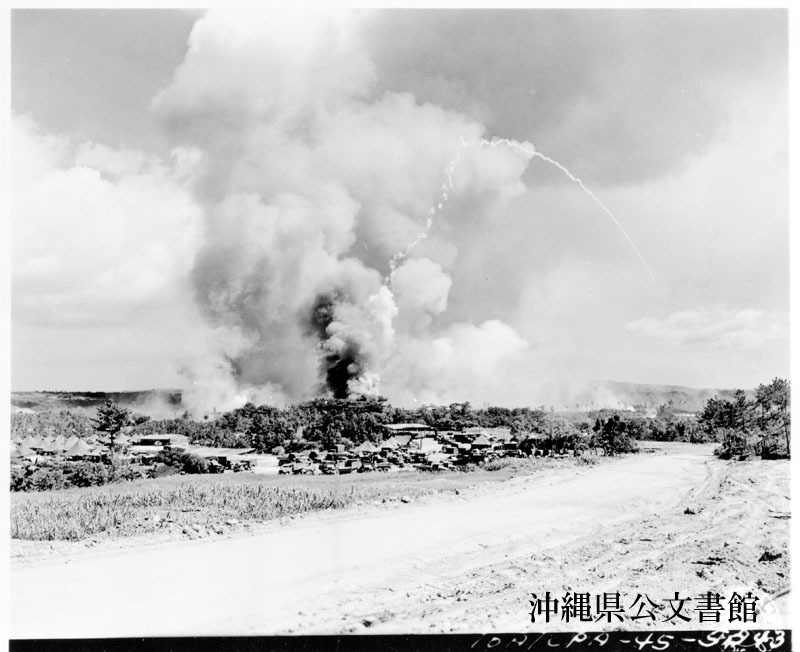 Smoke billows skyward and tracers fill the air as a grest explosion marked the occurence of a fire at an ammunition dump north of the Tenth Army. Sharpnel made adjacent areas untenable. The cause of the fire could not be determined. 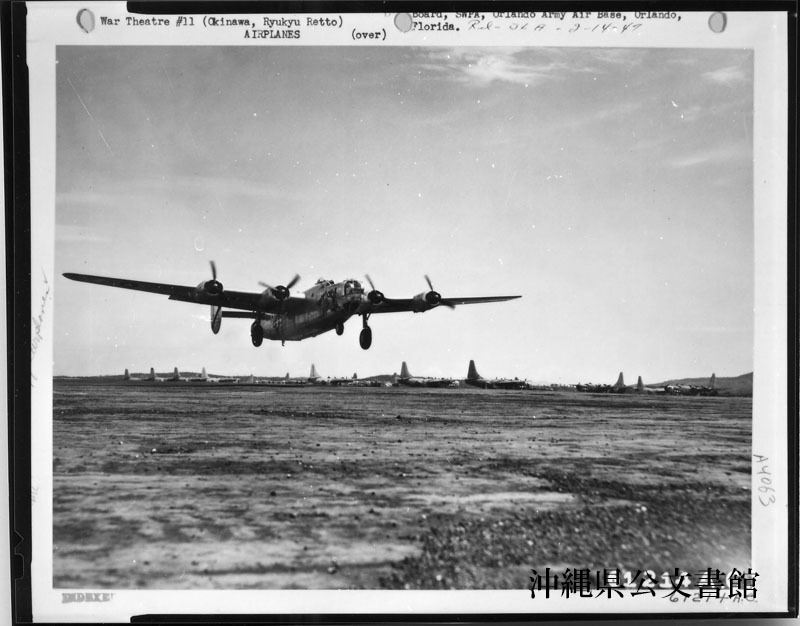 Consolidated B-24 ”Liberator” of the 11th Bomb Group, 7th Air Force, taking off Yontan Airstrip for a mission somewhere over Japan. Okinawa, Ryukyu Retto. Still from animated sequence in Two Down, One to Go. Members of 27th Inf. Div. 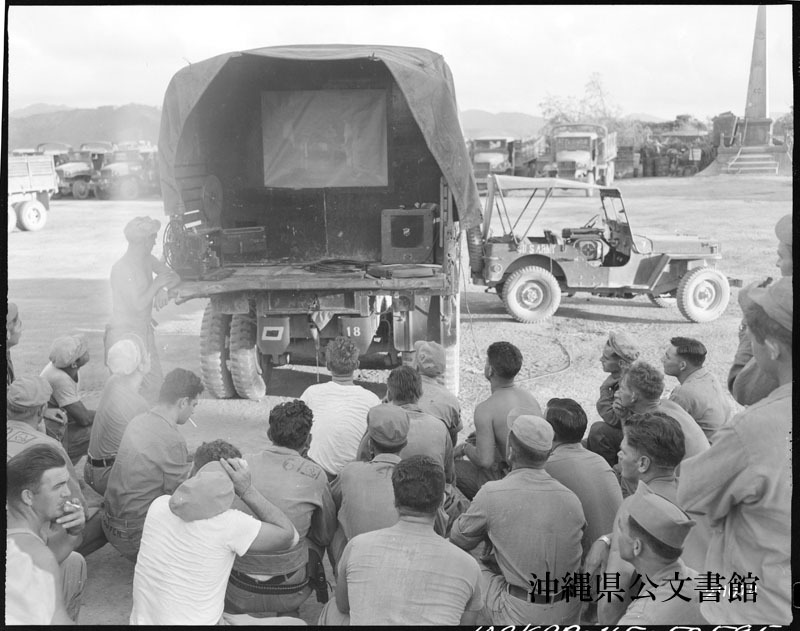 QM Watching Motion Picture ”Two Down, One to Go.”. Pressure regulator testing assembly used in connection with flame throwers. 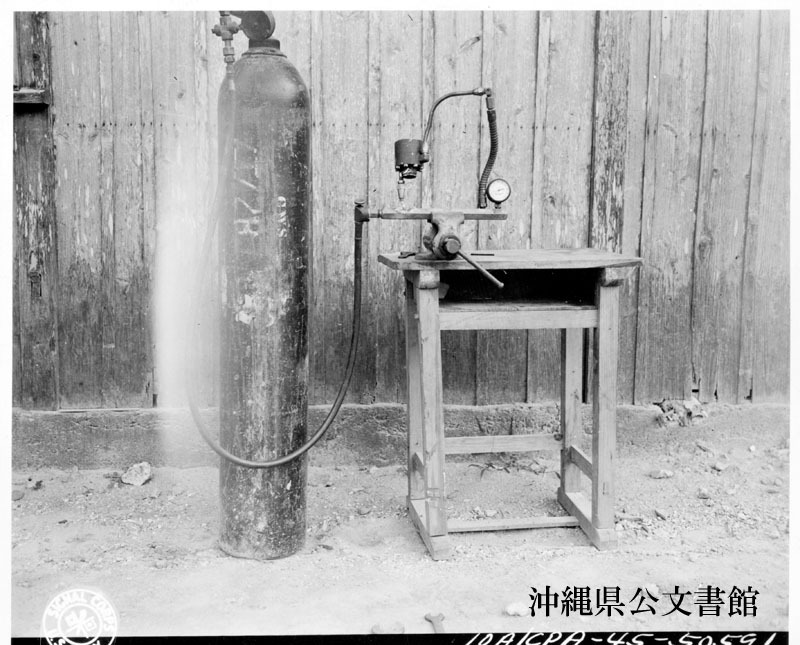 This unit devised by T/5 Joseph W. Towers, Chemical Section, Headquarters, 27th Division, requires less air pressure than other methods is used to familiarize operators with pressure regulator on the flame throwers and for testing. T/5 Towers is from concord, California. 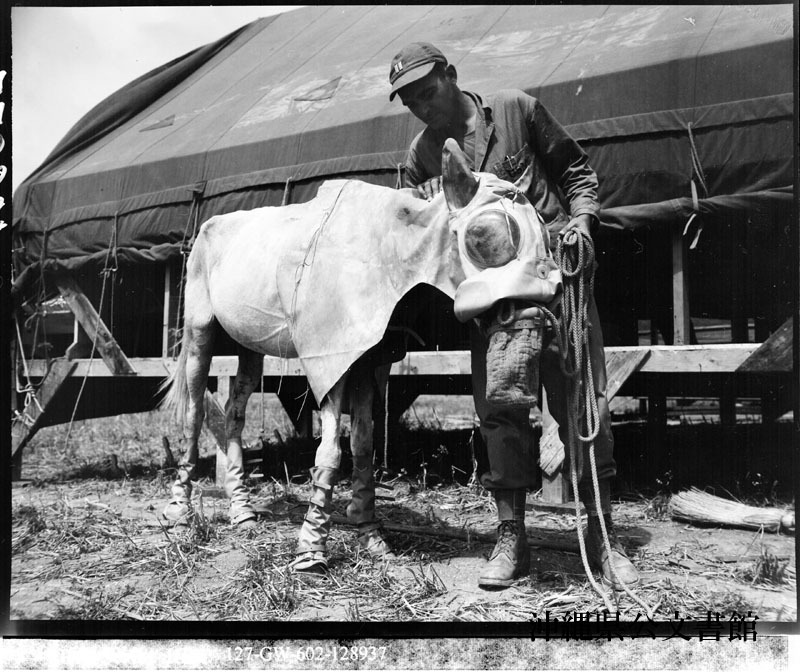 Gas mask for horse--The enemy on Okinawa thought they were prepared for everything before the 10th Army invasion. Army Capt. George P. Dawson, Jr., tests for size a gas mask for horses. 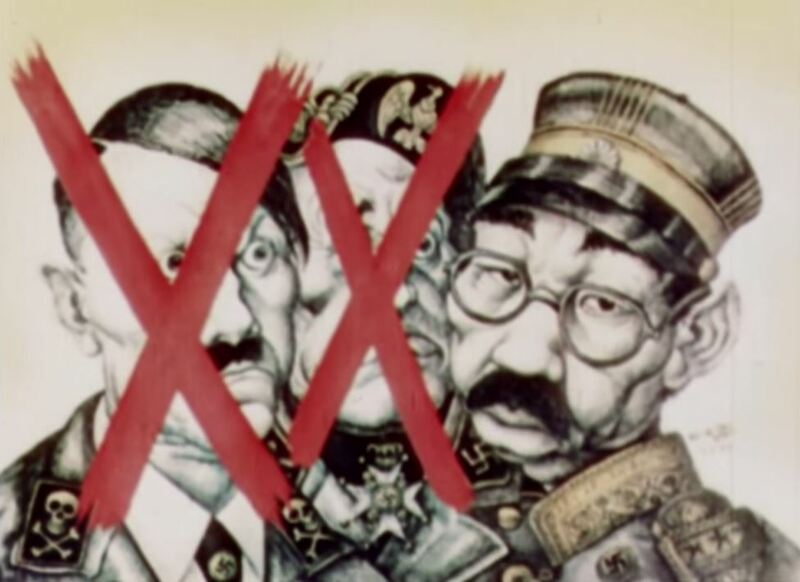 The contraption was found in a Jap supply dump. Capt Dawson is chemical warfare officer for Marine Major General Louis E. Woods Tactical Air Force, Ryukyus.